Now I'm not going to let politics divide us, I'm not going to say what side left or Right I stand on, I'm just going to review this film. The irony is Michael Moore divides America just like Trump does, it just depends on the political divide you stand on, but the strange thing is this movie is barely about Trump, more on how he got to power from disgruntled voters who felt career politicians never listen to them and their vote isn't worth anything. 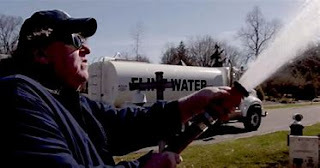 The film is split into many sections, the main one is the story of Flint Michigan, and its water supply since 2014 which would have been an interesting documentary on its own merits but it does explain how a small town is being poisoned by high levels of lead in their water and no politician cares. Even the Messiah Barrack Obama didn't care for these poor people, he choose to side with big business instead,whilst on a visit to Flint, he pretended to sip the water to prove it was safe to drink. We see the primaries being rigged in Hillary Clinton's favour against the popular Bernie Sanders, as the Democrats preferred Clinton, Michael even says when your vote is not used, and you feel your vote means nothing, people will be angry and vote accordingly. For a liberal journalist I thought Michael was equally, if more tough on the Democratic party, and they don't come off well in this documentary. All this is the very clever build up to how people voted for Trump in 2016, when people are not listened to by politicians, taken for granted for their vote, and the voter gets nothing back in return is why people turn to the protest vote. When Hillary didn't go to very Liberal states, instead sending a cardboard cutout and a spokesperson speaks volumes, especially in the biggest swing state Wisconsin with a 30% swing from Democrat to Republican. 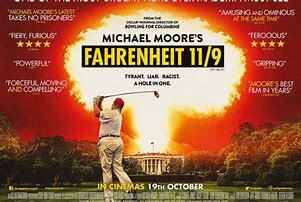 The final third of this movie is the usual liberal bashing of Donald Trump, but I got the weirdest sense that although Michael Moore hates Trump with a passion and everything he stands for, you get the impression that he admires him in a bizarre way, and seems to know him more than any other journalist. You can see and Michael makes this point, like a travelling snake oil salesman Trump had his voters in his hands, he spoke their language, they listened to him believing he would not be a politician, he would drain the swamp, it would be a new dawn without career politicians, he'll put America first, we all know now this was not the case as this was just closing a deal for him, it was more a business deal he wanted, he knew how to get it, he liked the fame, the power, the notoriety. He never really wanted to be president, it was a business choice, to get him on a larger stage, and in a way it worked, he became the first accidental president. to which everyone else is now stuck with. A very good documentary, that is not liberal or as left minded as you are led to believe, it is a very clever documentary about politics, and how it never really serves the voters who actually bothers to vote, but politics seems to be one big con, that us the general public are the pawns always caught up in it.